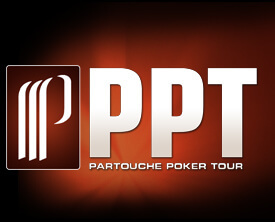 It’s hard to believe but the fifth season of the Partouche Poker Tour is coming to a close as the Partouche Poker Tour Main Event is now underway in Cannes, France, and it looks like it could be the largest PPT Main Event in the brief history of the event. Last year the PPT Main Event attracted 579 entrants, which is likely to be blown out of the water in 2012, considering 326 players registered on Day 1a of the tournament, and Day 1b has historically been the better attended day. The largest field the Partouche Poker Tour Main Event was in 2010 when 764 players registered; a number that is very much in jeopardy this year. In 2011 it was UK superstar Sam Trickett who captured the Partouche Poker Tour Main Event crown, besting a tough final table that included Oleksii Kovalchuk, Mads Wissing, and Roger Hairabedian. In 2010 it was another poker superstar who claimed the Partouche Poker Tour Main Event title, Vanessa Selbst. Selbst topped a final table that included Tobias Reinkemeier and Fabrice Soulier on her way to the title, but the big story was the disqualification of Ali Tekintamgac who was accused of using spotters to see people’s hole-cards. Of the 326 players that registered for Day 1a in 2012, a total of 155 made it through to Day 2, including 2010 champion Vanessa Selbst, Mike Mizrachi, 2011 WSOP Champ Pius Heinz, 2010 WSOP Champ Jonathan Duhamel, Lock Poker pro Leo Margets, Justin Bonomo, Dominick Nitsche, and future astronaut Jens Kyllonen. In just a few years the Partouche Poker Tour Main Event has turned into one of the most prestigious tournaments in the poker world, rivaling such stops as the PokerStars PCA, the Aussie Millions, and the WPT and EPT Championship. Each year since its inception the Partouche Poker Tour has awarded the winner a first-place prize of €1,000,000, with Vanessa Selbst taking home the largest prize in PPT history in 2010, pocketing €1,300,000. We’ll keep you posted as the final attendance numbers and payout figures for the PPT Main Event become available.